The Gastroenterology Center provides area residents with medical services to assist in the diagnosis and treatment of stomach, colon and digestive health conditions. Our highly-skilled gastroenterologists, William Z. Kolozsi, M.D. and Meredythe McNally, M.D., provide specialty care to patients with disorders of the digestive system, including treatment of Crohn's Disease, Ulcerative Colitis, Chronic Heartburn/GERD, Irritable Bowel Syndrome, Celiac Disease and other related health conditions. 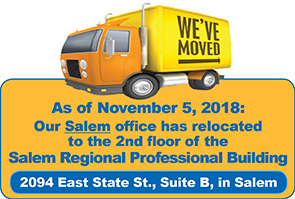 As of November 5, 2018, our Salem office is located on the second floor of the Salem Regional Professional Building, 2094 East State Street, Suite B, in Salem. The Salem Regional Professional Building is a 3-story building located across the street from Salem Regional Medical Center (SRMC), and is connected to SRMC by an elevated glass walkway over East State Street. The Gastroenterology Center's Columbiana office is located in Suite A of the Columbiana Medical Center, at 750 East Park Avenue. Please call our office at 330-337-8709 to schedule an appointment, or for more information.